Home Blogs Could the oil price triangle be close to cracking? As discussed yesterday, energy markets are now going through major change. Many of the investment banks who led the move to higher prices post-2008 are closing their commodity trading desks and withdrawing from the markets. Equally, the physical traders recognise that trying to push prices higher, without a real geopolitical threat, is like trying to push water uphill. Simple forces of gravity – today’s vastly increased supply and lower demand growth – make the job challenging in the extreme. Thus markets may be about to return to their traditional drivers of supply and demand. IS THE TRIANGLE ABOUT TO BE BROKEN? If the triangle does break on the downward side, then prices will likely fall very fast. The record period of stability around $100/bbl means almost nobody in the markets believes prices could ever fall below $90/bbl again. So the shock value of a return to historical normality around $40/bbl (in $2014) would be enormous. It would also expose the glib assumptions of the ‘experts’, who assume production would immediately shutdown at prices below $90/bbl. What would actually happen is that market-share wars would develop as everyone ran for cash. Similarly governments would face a stark choice between either being able to fund their social programmes, or losing power. In this scenario, prices below $50/bbl would be a likely potential outcome. Equally important is that this type of price shock would almost certainly be the trigger for global deflation. As the blog will discuss tomorrow, central banks would find this very difficult to combat. WHAT HAPPENS IF PRICES DON’T BREAK IN Q3? If prices continue to remain stable in Q3, then the opposite risk will emerge in Q4. Demand will then rise to seasonal peaks ahead of the northern winter. And the potential impact of a geo-political development – such as the cutting of Russian gas supplies to W Europe through the Ukraine – becomes that much greater. Of course, the triangle could also continue to extend itself. Markets might continue to live in a world where their price discovery mechanism remains broken. This would simply mean that risks continued to build for the future. We are living in a very dangerous world. Prices for most commodities became divorced from the reality of supply/demand balances over the past 5 years. Instead, markets were swamped with record levels of easy money by the central banks. The process of returning them to their true role of price discovery is thus not going to be easy. Even the simplest and most direct route, of taking prices back down to reality as fast as possible, will inflict enormous pain for producers in terms of lower income, and for consumers in terms of working capital losses. Bankruptcies could well prove inevitable. The alternative, where real geopolitical risks emerge to cut off major supply sources, would cause untold damage to the economy. 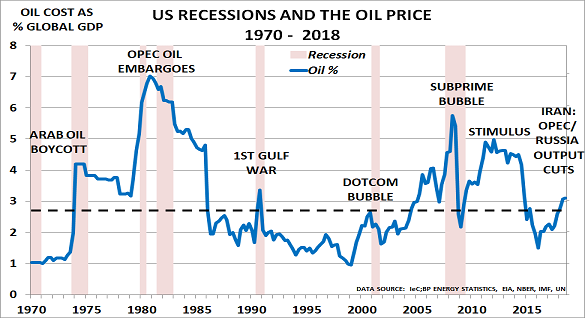 The first and second oil price shocks in 1973/4 and 1978/85 were bad enough. If Europe loses its gas supplies next winter, for example, then life will become very difficult indeed.